When I first told people I knew that I was going to go camping for 19 days in Southern Africa, many of them pulled one of those, “Wait, you're going to what?” reactions. And I wasn't too surprised. First of all, I've never been much of a camper. I like the outdoors and all, but I also enjoy my creature comforts like a comfy bed and daily hot showers. I honestly wasn't sure how I would fare camping for nearly three weeks, sharing a tent with a stranger, and all while traveling through Africa. Secondly, the concept of overlanding isn't one that all travelers are familiar with, which meant I did a lot of explaining along the way, too. So, to hopefully answer all the questions I've faced when telling people about my overland trip, I've put together this post of all the things you'll need to know. “Overlanding” means exactly what it sounds like – you travel over land without the use of planes. In Africa, overlanding is done in purpose-built trucks with giant tires and everything you need to travel for weeks, including tents and cooking supplies. 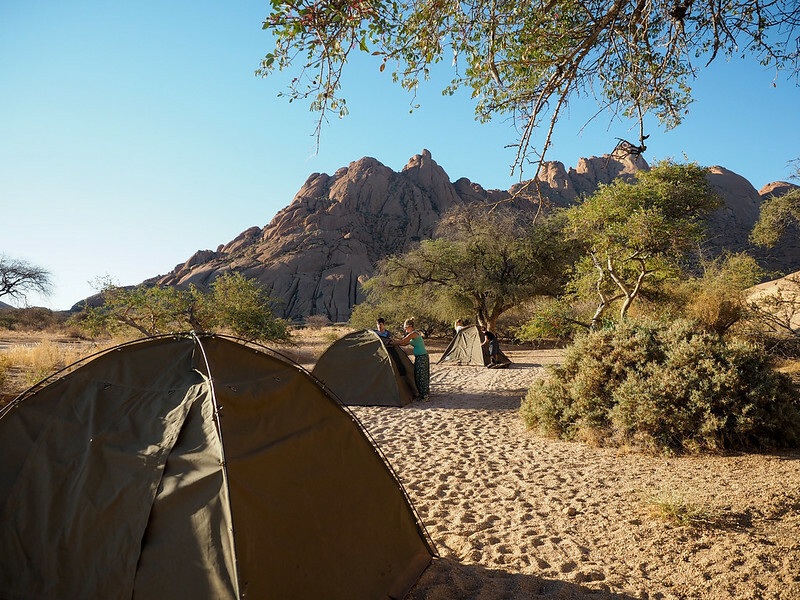 You camp in shared tents, help cook meals, and experience the continent in a budget-friendly way. I only overlanded from Cape Town to Victoria Falls (Southern Africa), but you can overland most of the continent of Africa, going all the way to Nairobi and even Cairo. 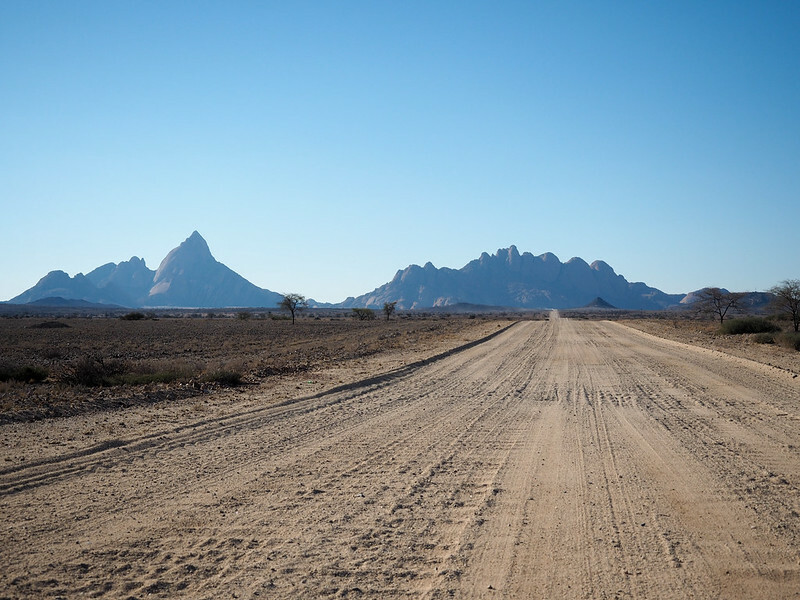 Many people will tell you that an overland trip is the only way to see the “real” Africa, since it means driving along the dusty roads and through all the tiny villages that make Africa… well, Africa. While I’m not sure if that’s entirely true (I don’t think there’s any “right” or “wrong” way to experience any destination), I can’t deny that my overland trip was a great way to see parts of countries that I would have never seen if I had just been hopping between the big cities and tourist hot spots. 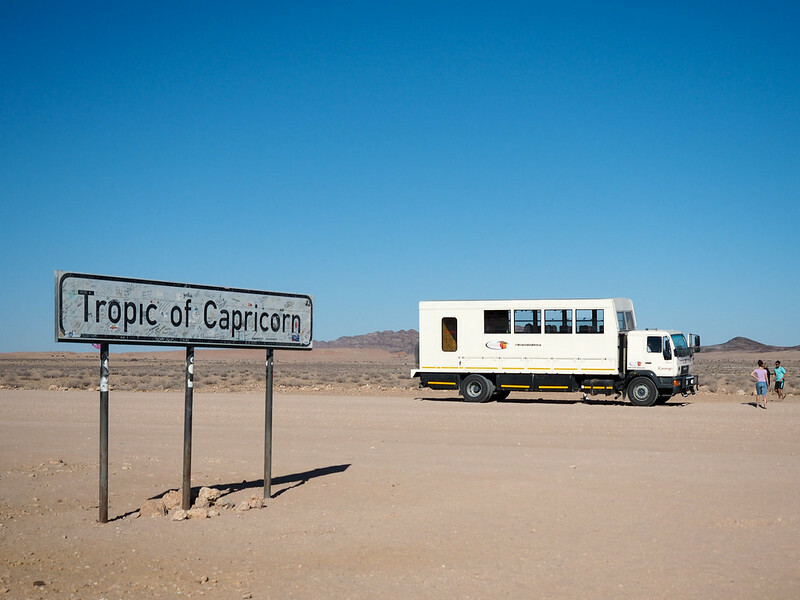 There's also something to be said for taking to the road in places like Namibia and Botswana. It really felt like an adventure. Which overland company did you choose? 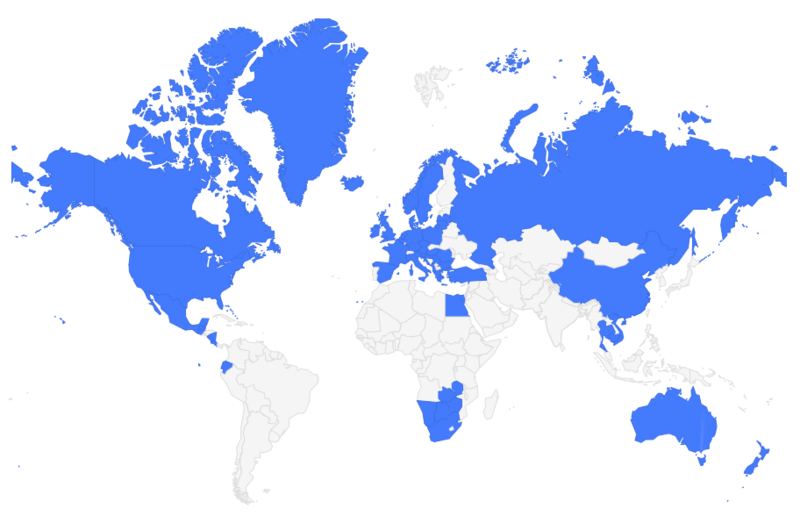 There are a whole host of overland companies out there to pick from. Some are super budget-oriented, while others offer more luxury. I ended up booking the with because it's in the middle. 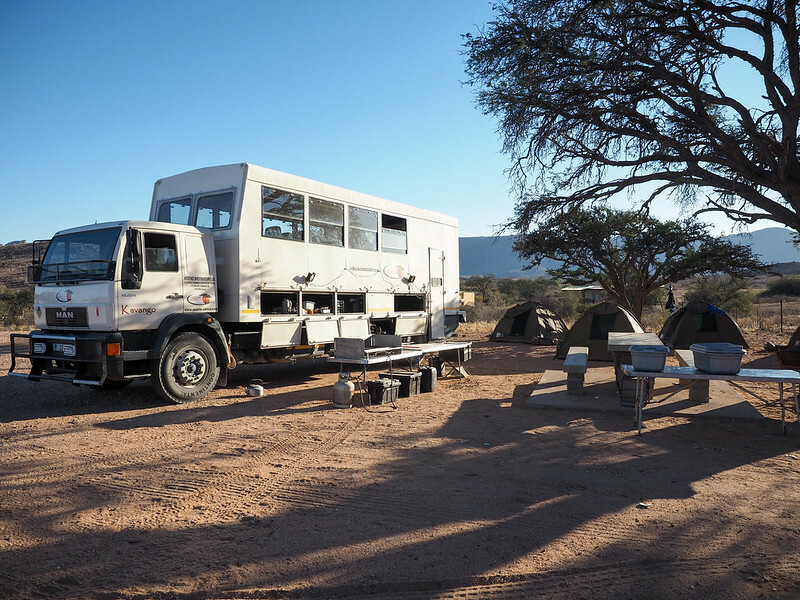 Acacia tends to stay in nicer campsites and is known for having pretty nice trucks – but it's still great value for money. If you're not excited about sleeping on the ground every night, Acacia also offers accommodated options for a lot of its tours, though that does increase the price of the tour by quite a bit. I decided to go the camping route simply because it's the “normal” way to overland, and I wanted the full overland experience. My started in Cape Town, passed through Namibia and Botswana, and ended in Livingstone, Zambia, near Victoria Falls. There was A LOT packed into this trip, and a ton of once-in-a-lifetime-type activities. So much wildlife in Etosha National Park! 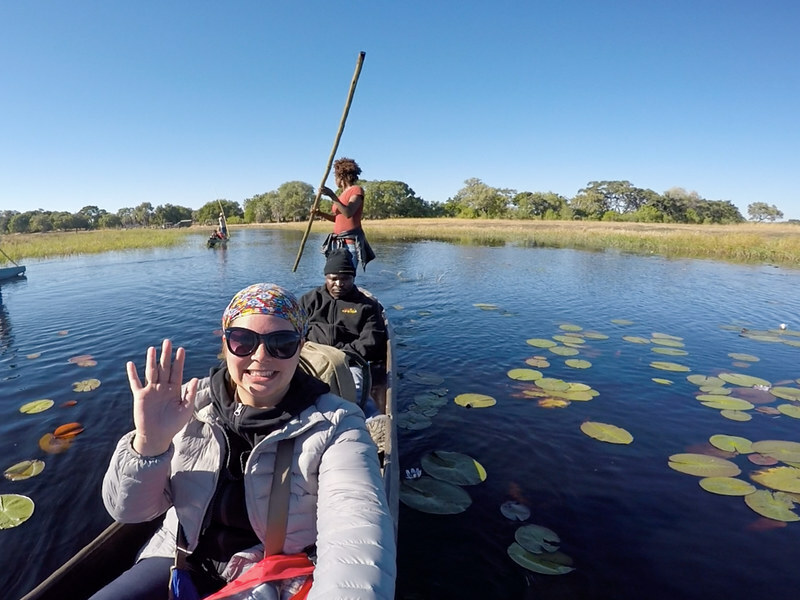 The tour I went on starts at around $1900 per person, an additional $375 activity fee that covers some of the activities listed in the itinerary that are operated by other tour companies (like the overnight trip in the Okavango Delta, the safaris in Chobe, and the trip out to Deadvlei in the Namib Desert). The price includes all your transport, accommodation, guides, and all meals with the exception of 1 lunch and about 3 dinners. 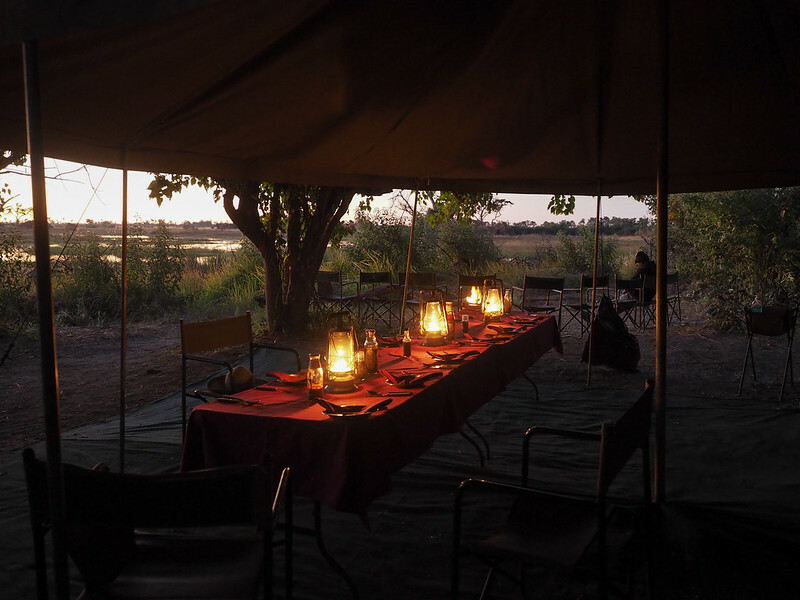 Along the way, there are other optional activities, too, like canoeing on the Orange River, sand boarding in Swakopmund, a nighttime game drive in Etosha, and flying over the Okavango Delta. For these, you'll pay extra if you choose to book them. Who goes on a trip like this? I would say overlanding in Africa appeals to the adventurous, intrepid traveler who is looking for a budget-friendly alternative to seeing Africa through a series of luxury lodges. As per usual when it comes to traveling on tours, the majority of my group were from Australia (those Aussies sure do love to travel!). I was the only American in our group of 11, and then we also had England, Germany, and the Netherlands represented. 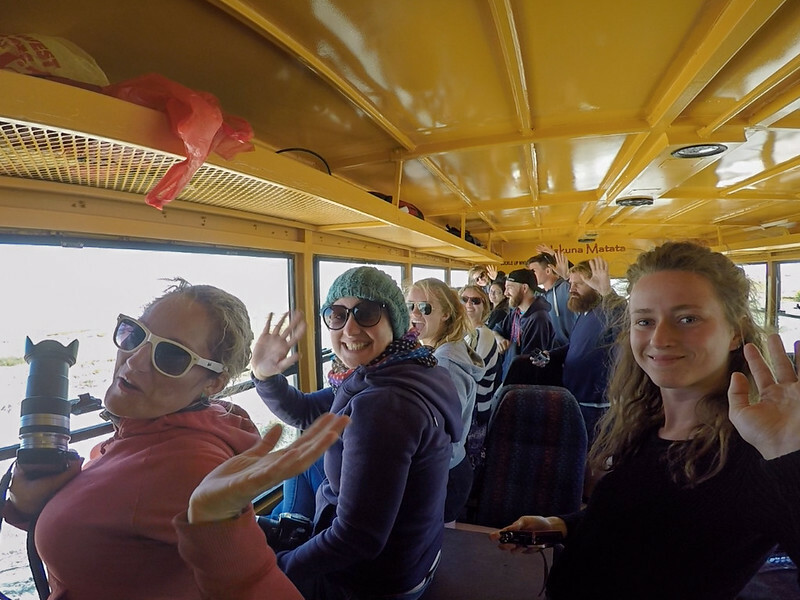 Interestingly, there were a lot of solo female travelers on my tour. I was expecting more couples, but there was actually only one! It makes sense, though – this is a great (and safe!) way for a woman to travel on her own in Africa. With Acacia Africa, we had one guide and one driver for the entirety of our trip. They also doubled as cooks/BBQ masters, game spotters, and coordinators when it came to things like packing up and crossing borders. Both our guide, Philile, and our driver, Khumbu, were from Zimbabwe, and they were both amazing. Always in a good mood, always up for a chat (whether it was about lunch prep or the current political atmosphere in Zimbabwe), and always able to whip up incredible camp meals. What is the truck like? 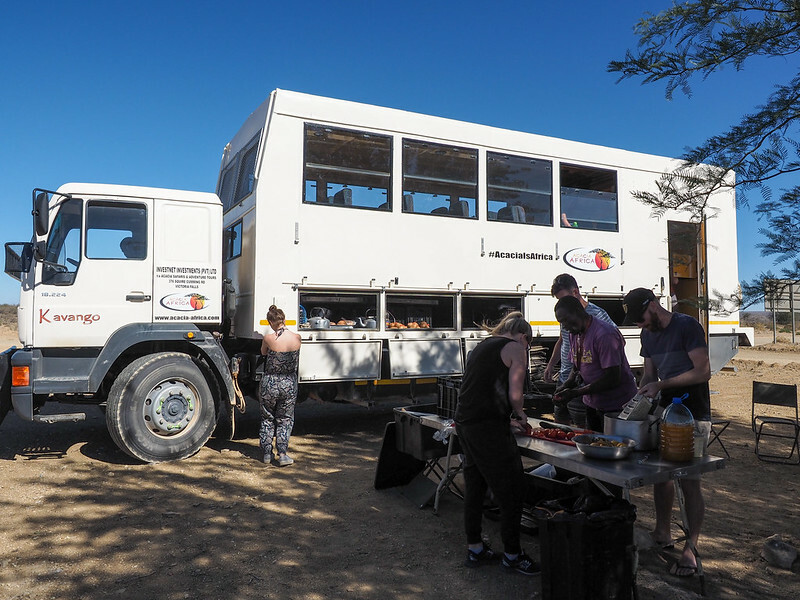 Overlanding on a tour like this is usually done in a purpose-built truck that is made to both handle the often-rough African roads and to carry everything you need. Personal belongings are kept inside in lockers, and tents, tables, and cooking supplies are kept in compartments on the side of the truck. 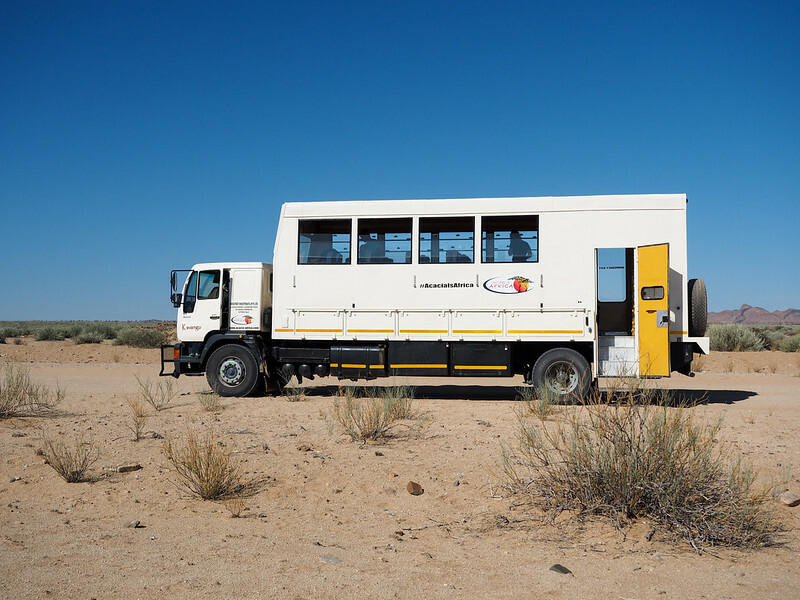 Our truck, Kavango, could hold 24 passengers – but luckily there were only 11 of us on the leg of the trip I did! This meant we could spread out inside the truck, and also meant that we could take up 2 lockers each if we wanted (yesssss). One thing to note about these trucks: they will all utilize “African air conditioning,” which in simple terms means just opening up the windows. This means it can definitely get hot inside at times, and also means that you and all your stuff WILL get covered in a fine layer of road dust. You'll get used to it. Most overland trips will have you camping in two-man tents. The tents used by Acacia Africa are incredibly easy to put up and tear down (seriously, 5 minutes tops once you've done it once or twice), and are big enough inside to sleep two people without you having to be right on top of each other (which is good if you're traveling solo and paired up with someone you just met!). Acacia Africa also provides sleeping mats that fit nicely into the tents, which is a bonus since it means you don't have to bring your own. 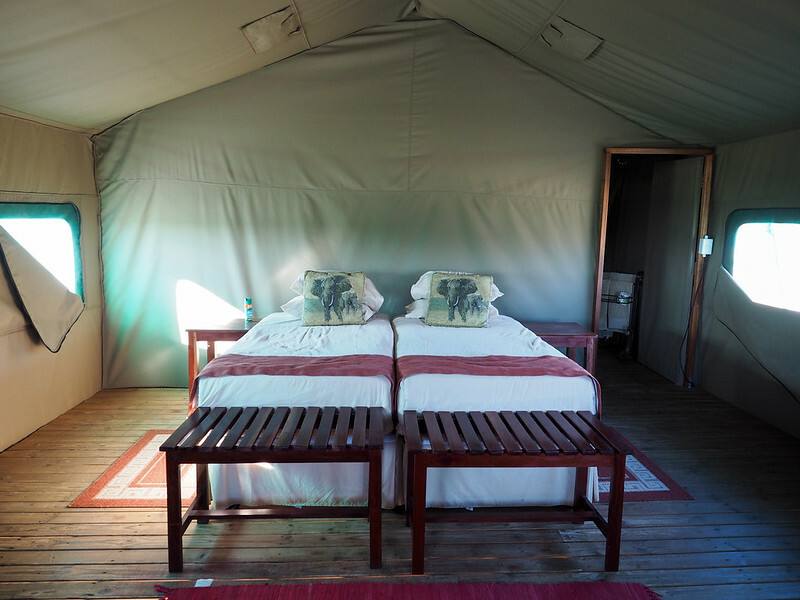 Like I mentioned earlier, Acacia Africa stays in some very nice campsites, especially in Southern Africa. All but two of our campsites had flush toilets and hot water showers – and the ones that didn't were amazing enough that the lack of running water didn't even faze me. We even stayed in a hostel dorm for two nights in Swakopmund. Most of the campsites we stayed in had very clean facilities, plenty of toilets/showers for larger groups, and extra amenities like pools and bars. The camp we stayed in in Etosha National Park even had a watering hole that was floodlit at night so you could see all the elephants and rhinos coming in for a drink after dark. 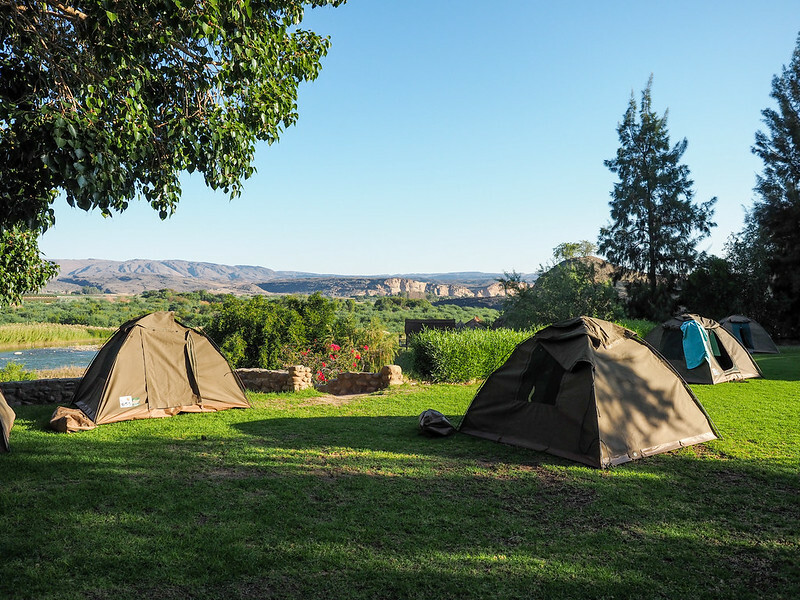 Many campsites also offered the option to upgrade to fixed tents or normal hotel rooms for an extra fee. I ended up doing this about four times, with prices ranging from $30 for a bed + electric blanket in a fixed tent in Windhoek to $100 for a private chalet on my last night of the tour in Livingstone. I've heard from others who have overlanded in other parts of Africa that the campsites get much more basic the further north/east you go. 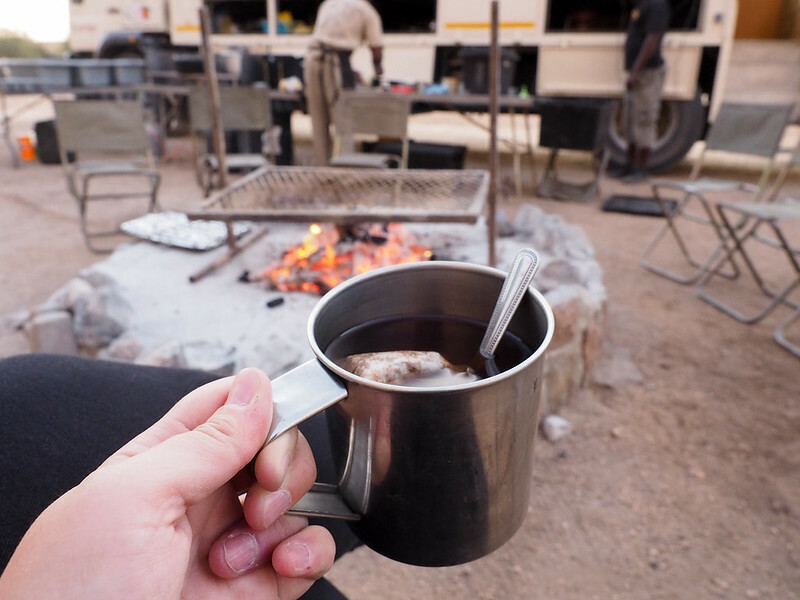 I, however, can only share my experience in campsites in Southern Africa. 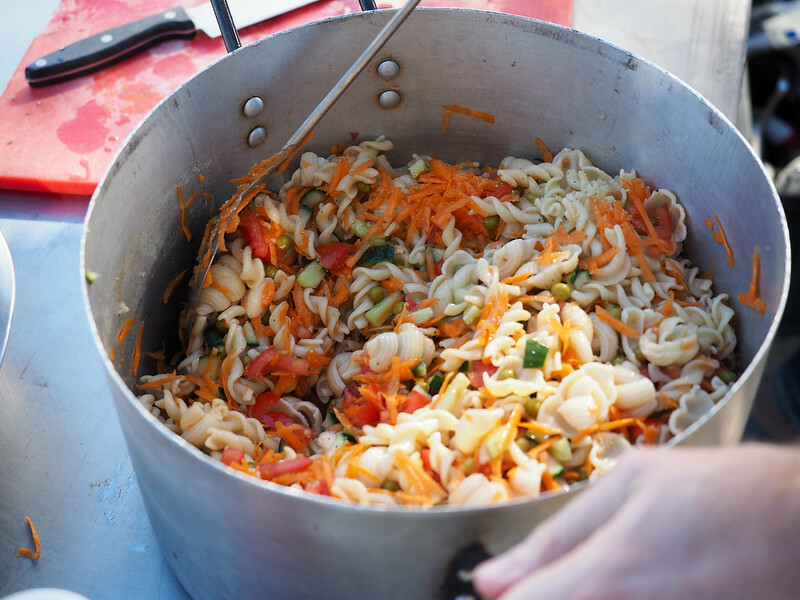 The food you'll get on an overland trip depends entirely on the skills and creativity of your guide and driver. We were extremely lucky that Philile was a GREAT cook. Even our roadside lunches were usually impressive! Breakfast would always include cereal, fruit, and tea/coffee, and would sometimes also include eggs and bacon. Lunch would usually be something quick like pasta or rice with veggies, and occasionally if we had a long driving day we would make sandwiches at breakfast and store them in a cooler on the truck. Dinner was always the star of the show. We had everything from grilled steaks to fish baked over the fire to burgers with stuffed squash. I was also so impressed by Philile's attention to detail when it came to someone like me with a mild dairy allergy (he always made sure to have soy milk on hand), or the sole vegetarian in our group. Will I have to cook? An overland trip does require a *bit* of participation from everyone in the group. Our group was divided into four smaller groups that rotated through four major chores: cooking prep, washing up, packing, and truck cleaning. None of these duties were difficult. Cooking prep usually just meant chopping veggies. Washing up only applied to big pots/bowls since everyone was in charge of washing their individual plates and cups after every meal. Packing could sometimes take longer depending on how much was unloaded from the truck (though everyone packed up their own tents). And truck cleaning was basically just sweeping once or twice a day to remove all the sand and road dust. What is an average overlanding day like? Days on an overland trip tend to start early. Breakfast was usually between 7 and 7:30 a.m., and we were usually on the road before 8 a.m. This wasn't an issue, though, since most of us were usually up before 7 anyway! Some days we would drive for only a couple of hours, while others saw us on the truck for 6 or 7 hours. If it was a longer day (more distance or maybe a long border crossing), we would either make sandwiches at breakfast to have on the truck, or we would stop on the side of the road for sandwiches or maybe a quick pasta dish. Pit stops usually occurred every couple of hours, and thankfully there are enough small towns in Southern Africa that we usually got to stop at a gas station or shopping center to use the toilets. These were always flush toilets and usually cost a bit of change to use. And this meant you usually had the chance to pick up snacks/drinks at least once per day. We would usually arrive at our campsite for the night either right around lunchtime or a little afterwards. Setting up tents was always the first order of business, followed by lunch/relaxing, and possibly an optional activity if one was offered. Dinner was usually between 6 and 7 p.m. each night, and afterward we'd sip tea or coffee and have a brief team meeting with Philile and Khumbu to go over the plan for the following day. We were all usually in bed by about 10 p.m.
Acacia Africa provides sleeping mats that you can use, but you'll need of your own. I recommend getting one that's rated down to at least freezing if you're going in the winter months – it gets COLD in the Kalahari, people! 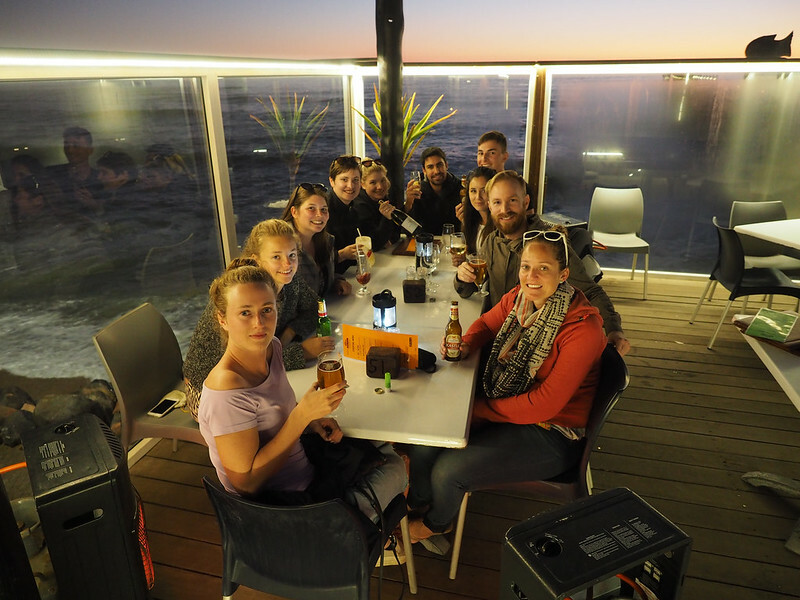 – Especially if you're traveling in winter, you'll often be waking up before sunrise and eating dinner after sunset. Meaning having a headlamp is really invaluable for maneuvering and doing things like getting out of your tent or eating dinner in the relative dark. A pillow – A few people in my group ended up buying proper pillows on the road, while others opted for the inflatable variety. This is totally personal preference. I brought with me and ended up liking it so much that I didn't bother purchasing a real one. (or two) – You'll have a locker for all your personal stuff on the truck, but you'll be responsible for your own padlock. I recommend a combination lock so you don't have to worry about keeping track of a tiny key, and if you can get one instead of a rigid metal one, you'll rest assured that it will fit the lockers on your truck. A mosquito jacket – Lastly, don't forget about protection – bug protection, that is! Mosquitoes aren't a huge problem in Namibia and most of Botswana in the winter months, but you'll still encounter them. And mosquitoes in parts of Botswana and Zambia can carry diseases like malaria, so you really want to make sure to take precautions. I brought with me and did not get one bite. I also recommend so you can capture all the awesome things you're going to see. And, even though it's not a tangible item, you're required to have travel insurance for a trip like this, too. I recommend buying coverage through . They offer the most affordable basic travel insurance out there. RELATED: Check out my video from this trip! Locker size can vary between different overland companies and even between different trucks. The lockers on our truck, Kavango, were about 70 liters. They are usually deep, but not always super tall – so a backpack or soft duffel bag is always preferable to a hard-sized suitcase. I had my 60-liter , along with my 25-liter filled with all my photography/tech gear. Everything probably *would* have fit into one locker, but it would have been a really tight fit. Luckily our truck wasn't even half-full, and therefore a lot of us ended up claiming two lockers – but don't count on this happening! When packing for a trip like this, less is definitely best. Most overland companies run their tours year-round, and every season has its pros and cons. 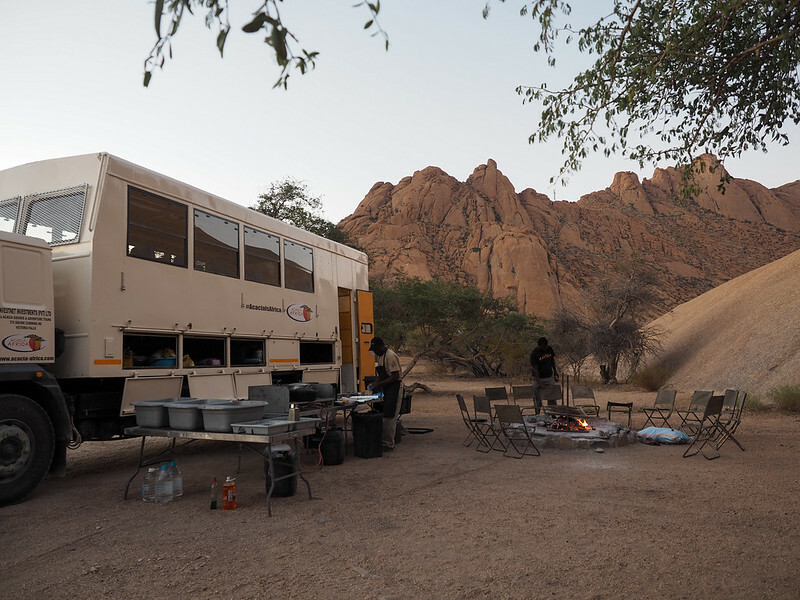 I went in Southern Africa's winter because I liked the idea of less bugs and cooler temperatures (especially knowing that most overland trucks lack air conditioning). We had sunny clear days nearly the entire time, and it still got plenty warm in most places (this wasn't “winter” like I'm used to in Ohio!). Certain things will be the same year-round – like the dunes in Namibia – but other things do depend on the season. I only overlanded from Cape Town to Victoria Falls, but you can overland much further and for much longer if you want to. Some of the people in my group were continuing on to places like Zanzibar, Nairobi, and Uganda. I even know people who have overlanded all the way from Cape Town to Cairo. Check out the if you're interested in a trip longer than 19 days. Next time, I definitely want to see Zanzibar and the Serengeti! Yes, yes, and yes again. I was a bit wary of embarking on an overland trip like this, but it ended up far exceeding my expectations. I think this is a fantastic option for solo travelers (and solo female travelers especially) to explore this part of Africa without having to worry about much of anything. 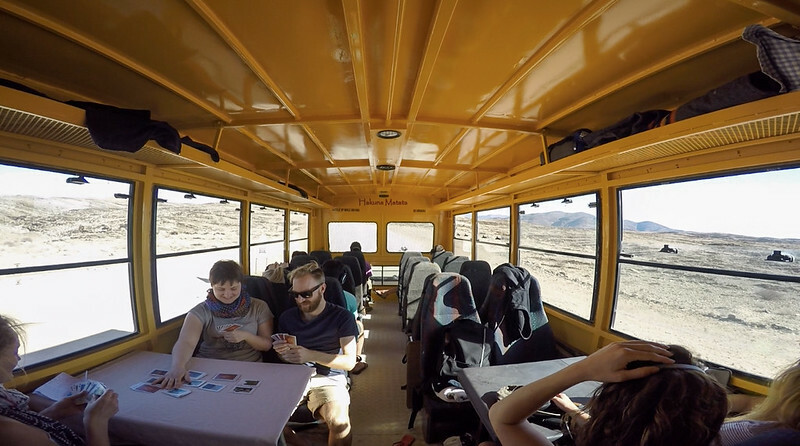 Would you ever go on an overland trip like this? What other questions do you have? *Note: I did receive a discount on this overland trip thanks to my partnership with Acacia Africa. As always, though, all opinions and observations are 100% my own! Akatuki — This trip looks incredible! Definitely something I’d be interested in booking in the future! Like you said, taking an overland tour is a safe and easy way for solo female travelers (like myself!) to experience Africa. Thanks for sharing all this information! I’m saving this post for future reference! I’m so glad I decided to go this route. Not only was it SO much better than I expected it to be, it was affordable and I felt extremely safe the entire time. Definitely a fantastic option for solo female travelers! That’s awesome – definitely let me know what you decide! I am so glad I finally made it to S. Africa earlier this year as so many blogs I read have just been and I would have been insanely jealous to be left out:-). I did an overland trip through Intrepid from Durban to C’Town that sounds very similar. While I think I realized I am a bit too old for camping (and upgrades were not readily available since I traveled during the weeks before and after Easter when EVERYONE is on the road) I loved the truck! and having a spot to leave my stuff to access during the day that is not in my lap. My guides only needed a little help in food prep and mainly in cleanup, but they HATED when we tried to pack the truck, as they had their systems down:-). Funny enough my group tended to be on the older end (almost everyone was 30-35-ish) which I was surprised about, since I heard Intrepid skewed younger and this was my first time using them. Yay for African travel in 2016! Seriously, with the exception of the distance (2 days there and back from the west coast), the price is right! Intrepid is usually my go-to for organized tours, but unfortunately the dates just didn’t work out for this one (since I was doing a tour with my dad beforehand). Luckily Acacia was just as good! I’m glad to hear you loved your trip too, though. Overlanding really is the way to go, I think. Hi Rebecca, Glad you enjoyed your trip. I’m doing a 48 day tour with intrepid from Kenya to Cape Town. Im excited but nervous as I really just dont know what to expect. Thanks for sharing. I’m sure you’ll have an amazing time, Ray! Intrepid is usually a great company to travel with, too. Thanks for this! I’m doing a 77 day overland beginning in September so this is super useful and got me really excited as I’m visiting all of these places. Ahh that’s awesome! I don’t think I could do this for 77 days, though, so more power to you! You’re going to have an amazing time. I’m a little breathless right now — this looks like SO much fun. What a great way to see Africa! Thanks so much for sharing. This looks like a ton of fun! I’d love to do this one day. I’m really glad I decided to do it – I could definitely see myself doing another overland trip someday! If you love camping, then overlanding would absolutely be for you!! Thanks for this post, I am wanting to go to Africa at Christmas time, but unsure what tour company to use. This post was really useful – thanks! The pictures are incredible and have got me excited to book my trip! This sounds like an amazing trip and I think it’s great value considering the duration of the journey! I did South Africa by hop-on-hop-off bus and hostels, but I left wishing I’d had a bit more time to visit some of the neighbouring countries. When I go back, I’m definitely going to consider this overlanding tour – looks like and epic road trip to me! I think I have to agree with all the people who say overlanding is *the* way to see Africa. I really enjoyed it and would definitely recommend it if you want to see more than South Africa! In 1975 I did an overland trip from Joburg to London. We – 19 driver – traveled Imamate over British army lorry, did all the cooking, usually over fire, and the rest of the work. We camped in the open, camp grounds didn’t exist, sometimes using two person tents. It took 4.5 months and was the trip of a lifetime! Holy cow, Joburg to London! Talk about an epic adventure!! This is EXACTLY what we want to do next. We have 2 kids though, so I think we’ll have to hire our own vehicle. Tricky…. But looks like a fantastic trip. Some overland companies offer family trips, too – might be worth looking into! This sounds like the perfect way to see Africa! I had never heard of overlanding until last year when I met a couple in the Grand Canyon who had done a trip with Acacia – they were at least in their late 40’s/early 50’s, too. It’s certainly one of the more stress-free ways of doing it! Solo backpacking is a breeze in places like Europe and Southeast Asia, but I didn’t really want to have to deal with figuring out everything on my own in Africa!